Looking for US History worksheets? 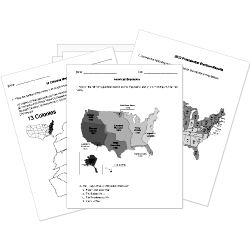 Check out our pre-made US History worksheets! You can create printable tests and worksheets from these Grade 12 Civil Rights questions! Select one or more questions using the checkboxes above each question. Then click the add selected questions to a test button before moving to another page. The Supreme Court case Plessy v. Ferguson upheld segregation. This was a tax meant to keep poor black people from voting. Who led a voter registration drive in Selma, Alabama in 1965? Movement of African Americans away from the South to the North,Midwest, and West that occurred from 1910-1960.What was this called? When was the Civil Rights bill enacted? What was accomplished with passage of the Thirteenth Amendment to the Constitution? People sat on the back of the bus (Rosa Parks). We all go to Starbucks and sit down and have something to drink. employees sit down and cause a work stoppage at a place of employment. When the workers at Dunkin Donuts stop making pastries. This movement had its origins in 1950s and achieved many societal changes during the 1960s starting as a nonviolent movement. The use of nonviolence to change unjust laws is known by what term? Black Power means that African Americans should unite as a whole and live to their greatness potential. An economic ploy used to restrict the voting rights of targeted citizens. Identify the group most likely to support Jim Crow laws. A policy used to eliminate discrimination in employment and higher education. Stokely Carmichael was born in and moved to at the age of 11. The NAACP was founded in 1909.